To capture on a canvas with such power! And to that world you take us to be free. Jayantha Silva is a self taught artist with a photographic memory and a passion for figurative art. One could say the passion is well fuelled by the enviable character trait, which enables him to create realistic paintings, in dark vibrant dark, vibrant shades of red, magenta, green, yellow and blue. “For many people, the most difficult form of art is figurative and portrait. But for me it is the other way around. 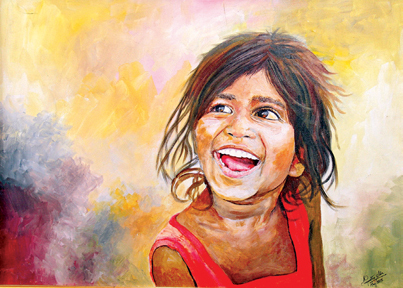 It is the easiest,” says Jayantha who loves painting children and old people because they are the most innocent. His themes are constantly evolving, but his subject matter remains consistent. Jayantha counts ‘Smiles of Sri Lanka’, where he uses his skills and passion to powerfully capture the innocence of children and the purity of childhood, is one of his all time favourites. 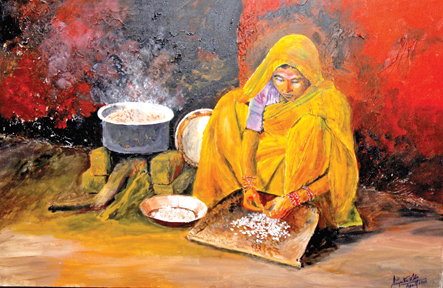 He also likes painting people in their everyday existence, like vendors, weavers and village folk. He also likes a touch of dreamy abstraction in his paintings. His painting titled ‘Deep Thought’ features a lady whose beautiful profile, in white and muted shades of light green, invokes thoughts of dreams and visions. The painting could be interpreted as an exploration of Sigmund Freud’s analysis of the sub-conscious mind and nature of dreams or an examination of Carl Gustav Jung’s extraordinary theory on parapsychology and dream and reality. Jayantha doesn’t talk about the artists who inspire him, but says everything in art is an experiment for him and that fortunately his experiments have always come right. He explains how one day he took a sheet of blotting paper, rolled it into a tube and kept it in place with cello tape, before sharpening it like a pencil. He then daubed that into charcoal and pastel and used it to paint the eyes and noses of his figures. Discovering new things through experiments is important to Jayantha, who says experimenting teaches him to be a patient person. He says he doesn’t have a technique as such, but that his earlier pastel drawings were quite dark and a lot of people didn’t think it was a pastel drawing. “My technique is more realistic,” he says explaining that does not have a favourite medium but likes acrylic, pastels and charcoal because it best suits his style. 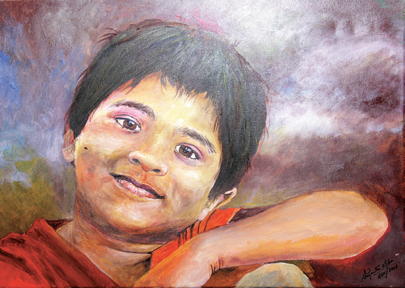 A past pupil of St. Peter’s College, Colombo, Jayantha remembers painting figures since he was ten years and says he won the first, second and third places at an art competition in school, which was judged by the eminent artist Mudaliyar Amarasekara. 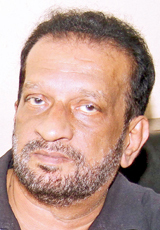 Jayantha recalls that when Amarasekara found out the same student had won all three prizes, he had offered Jayantha a one year scholarship at his art school. Jayantha had however not accepted the scholarship, a decision he deeply regrets today. “I was a very stubborn, different charactered person. I always thought art could never be taught. I attended his classes twice or thrice but never went again,” he says, admitting that he did the wrong thing because learning can definitely improve inborn talents. A full time artist, Jayantha set up his own advertising agency in 1981 because he thought there was no potential for artists. However, he gave up commercial art twenty years ago and became a full time artist. Today, while he spends most of his time in front of an easel, he listens to Country and Western music to relax and unwind, and sings in a choir, because he enjoys it.